Browse to the skin file (<ExportedthemeName>.zip) on your local drive. Themler skin includes two Themes: Home and Page. They are created by the appropriate Themler templates: Home Template and Page Template. For more information about Containers please refer to this article >> Places and Containers. <div class="panel panel-default pull-right"> <div class="panel-heading"><h3 style="margin: 0;">See Also</h3></div> <!-- List group --> <ul class="list-group"> <li class="list-group-item"><a href="http://answers.themler.com/articles/48480">How To Use DNN Skin</a></li> <li class="list-group-item"><a href="http://answers.themler.com/articles/49639">Themes and Module Containers</a></li> <li class="list-group-item"><a href="http://answers.themler.com/articles/49640">DNN Places</a></li> </ul> </div> ### How To Install DNN Skin 1. 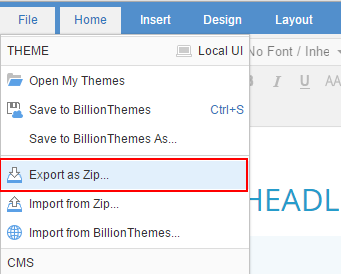 Use **Export as ZIP** option to export DNN skin without Themler: !dnn-export3.png! !dnn-export4.png! 2. Log in to your DotNetNuke Administration area as the "**Host**" user. 3. Go to **Extensions** -> **Install Extension Wizard**. 4. Browse to the skin file (`<ExportedthemeName>.zip`) on your local drive. 5. Follow the wizard steps until the skin is installed. 6. Go to **Admin** -> **Themes** 7. 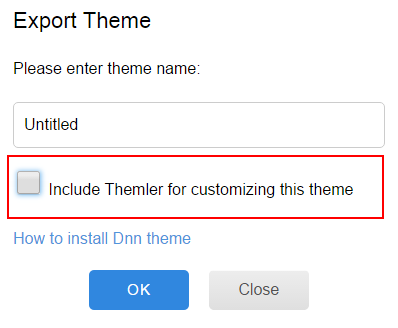 In the Theme Editor select the *Theme*: !dnn-themes-enable.png! Themler skin includes two Themes: **Home** and **Page**. They are created by the appropriate Themler templates: Home Template and Page Template. 8. Select **"module"** *Container*: !dnn-containers.png! For more information about Containers please refer to [this](page:49639) article >> Places and Containers. : http://themler.com!dnn-export2.png!!dnn-export2.png! !dnn-export3.png!